This recipe was a major rebound for me. You know, something to snap you back into action. Something to make you feel like you've still got it. We are still talking about food here, people. With all the craziness that has been going on in our house the past few months I have felt like a hot mess. The recipe ideas just haven't been flowing like they normally do. There are always times throughout the year when this happens, and I think I'm finally snapping out of it. It may have something to do with the seasons changing. For some reason I am more excited than ever about fall. The cool nighttime and morning temps, squash, coffee, pumpkin spice, cozy sweatshirts, etc. It's making me feel all warm + fuzzy inside. This recipe may not star a particular fall-specific ingredient, but it's warm, comforting, and pretty easy to whip up for a weeknight dinner. This kind of reminds me--not in taste but in the type of recipe--to the lemony millet + chickpeas I made this past summer. While the flavor is hearty it's also pretty simple. You have all sorts of texture happening with each bite, and this is a meal that can be eaten all week long for lunch or dinner. Stuff it in a pepper. Stuff it in your mouth. Stuff it in a giant collard leaf. Heat a pot with a swirl of oil over medium. Rinse + drain the millet then add to the pot and toast [stirring] for 3-4 minutes. Add the veggie stock and water and bring to a boil. Stir once then reduce heat to simmer and cover for 20min. Do not stir during this time. Be sure the liquid has absorbed [tip the pan to check] then remove from the heat and let sit for 10 minutes, keeping covered. Fluff with a fork. 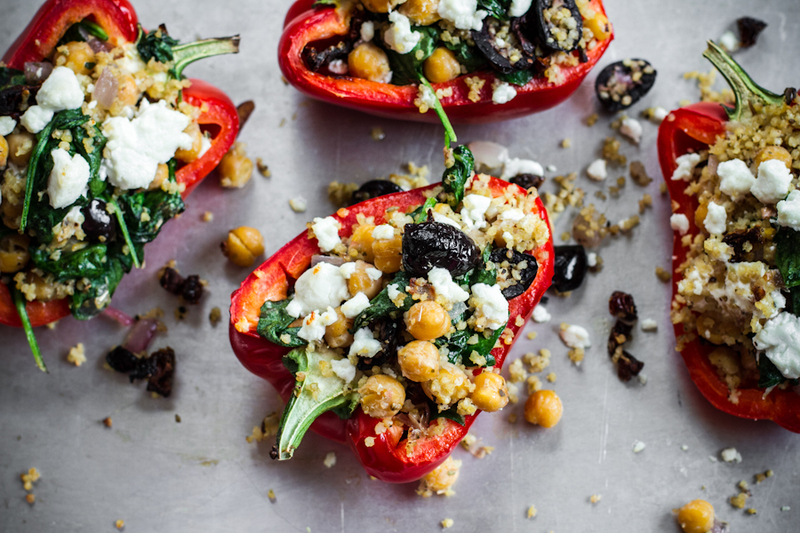 Preheat your oven to broil and lightly oil, salt, and pepper the halved peppers and place on a baking sheet. Just as you remove the millet from the burner, heat a large pan over medium and add 2-3 teaspoons of olive oil. Once hot, add the onion and stir occasionally until translucent and soft. About 5-8 minutes. Stir in the garlic, oregano, and black pepper for 30 seconds until fragrant, then add in the chickpeas and cook for about 6-8 minutes until starting to brown. 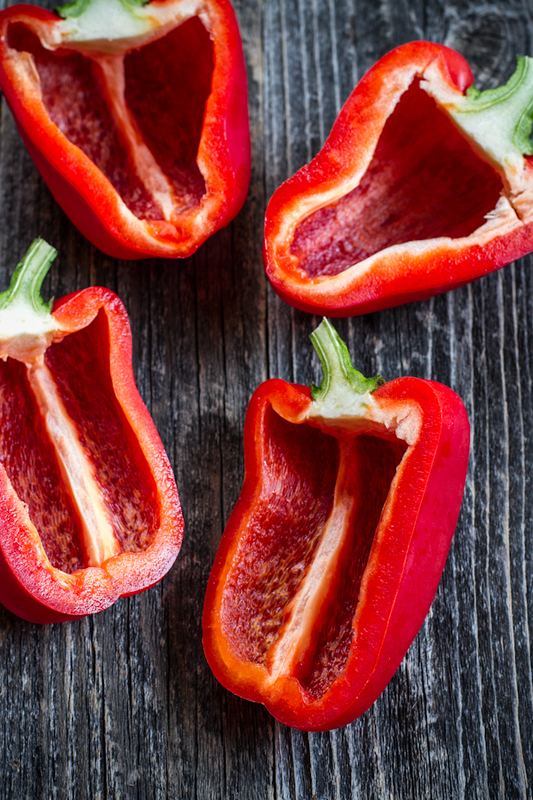 While cooking, place peppers under the broiler for a 2-4 minutes, then flip and broil for another 2-4 minutes. You want them slightly tender, not limp. Set aside. 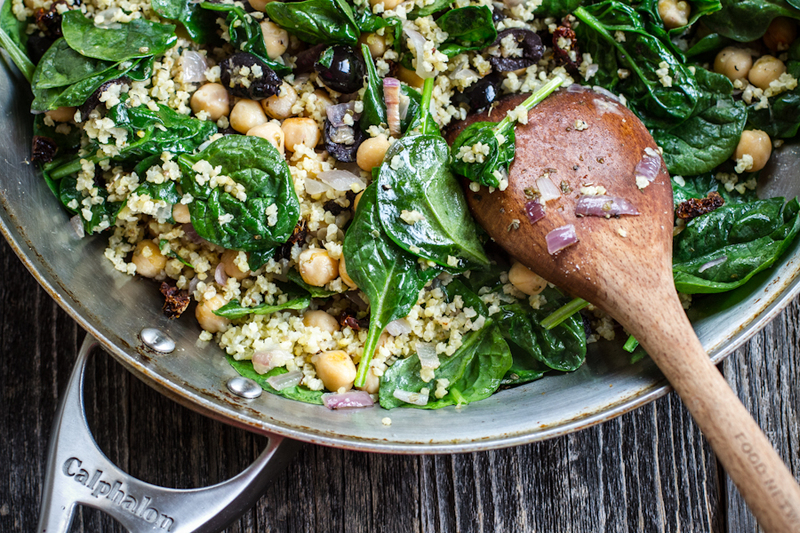 To your pan add the olives, sun-dried tomatoes, and 2 cups of fluffed millet and stir together. Add in your spinach and incorporate until just starting to wilt, another 3-4 minutes. Add half the feta, lemon juice, and lemon zest, then give it one more stir and taste. Add more salt if desired. The olives, sun-dried tomatoes, and cheese have a hefty amount of sodium so taste and add as desired. 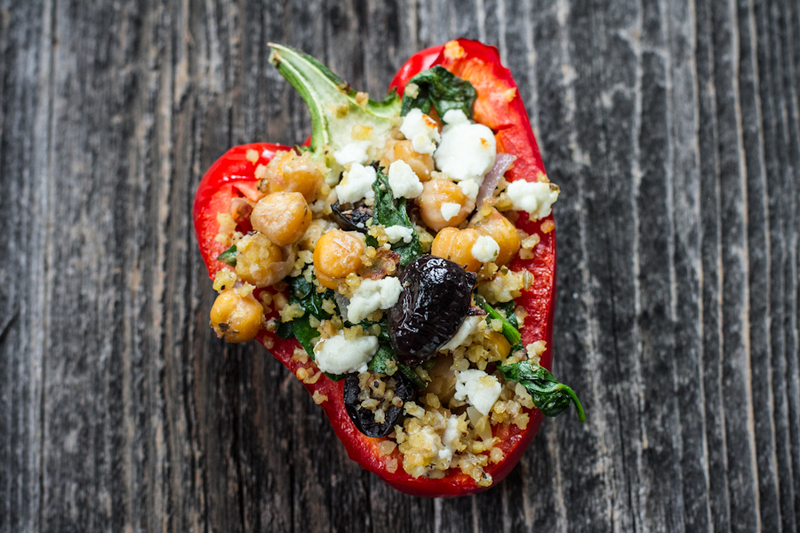 Lightly pack into peppers, top with remaining feta, and place under the broiler until the mixture starts to brown. About 2-3 minutes. notes/substitutions: For a vegan version simply leave out the cheese! Still delicious! Feel free to use dried or oil-packed sun-dried tomatoes. If using oil-packed, blot excess oil before chopping. Cooking 1 cup of raw millet yields about 3 1/2 cups, so you will have plain millet leftover. Today in doughnut land....I can't not talk about doughnuts this month! Be sure to check out Tieghan's blog, Half Baked Harvest, to see her review + drool-worthy photos for my Vegan Gooey Chocolate Doughnuts. Yep. You read that right. Vegan.Gooey.Chocolate. She's also hosting a giveaway! Stuffed peppers + doughnut cookbooks, what more could a person need?